Building on the success of its A3 Sportback, Audi will add the five-door design to two more model lines. One is a hatchback version of the A5, which could arrive as soon as this autumn. 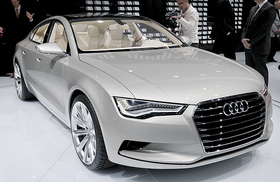 The other is based on the Sportback concept that previews the A7, set to enter production in 2010. The A5 Sportback, basically a five-door variant to the A5 coupe, most likely will debut in the second half of 2009. Currently offered as a coupe only, the A5 also will add a softtop cabriolet, expected to debut at the Geneva auto show in March. The A7 will be marketed alongside the A8 as a car for more spirited driving than the limousine-like A8.